If you are having trouble swaddling your infant with a blanket, I highly recommend using the Summer Infant SwaddleMe wraps. They are easy to use and made of breathable cotton fabric. Having a baby is a beautiful experience, and the time in the hospital is a whirlwind of emotions and information. Seems like just as soon as you checked in you are handed your tightly wrapped little bundle and swiftly given the boot. That, my tired friends, is when life gets real. "How do those nurses swaddle so well?!" You'll wonder as you stare down at your little Houdini, extremities flailing, your swaddle rendered useless. Want to know how to take the frustration out of swaddling? The answer is simple. The answer is *cue angelic chorus* Velcro! The Summer Infant SwaddleMe wraps are easy to use. Just slip your baby in the pocket, arms by their sides. Pull the right flap horizontally across their body so the Velcro lines up over the middle flap. Then pull the left flap over the right and secure the two Velcro tabs. Voila! You have yourself a baby burrito. Once your little one begins to show signs of rolling over, it is important to swaddle your little genius with their arms out. To do this, follow the same steps, just keep your baby's arms up instead of at their sides. The SwaddleMe wraps are a breathable cotton fabric and machine washable. On hot days, you can swaddle your little one in just their diaper. For nighttime sleep, I use a onesie and the SwaddleMe wrap. It keeps my infant warm and cozy, without overheating. 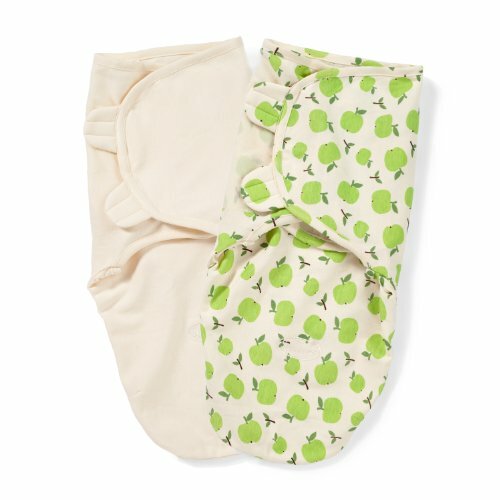 Organic cotton SwaddleMe wraps are also available, if you are so inclined. Check out the link below. Summer Infant SwaddleMe wraps can be found at your local baby department store. They can also be found on Anazon. I recommend buying the wraps from Amazon, since you can usually find a better price (rings true for other baby items as well). A note in size: I was able to use the small/medium size, specified for seven to fourteen pounds, for nearly three months. My baby is thirteen pounds and only fits in the large size, for fourteen to twenty pounds. I suggest buying the larger size if your child is close to fourteen pounds, since you can always wrap them tighter. In my experience, the baby can easily break out of the SwaddleMe wrap once it becomes too small. Your very own baby burrito! Or you might prefer your baby burrito to be organic.